I was working with this recipe a few weeks ago when I was trying to make jelly beans. While the jelly beans didn't work out very well (total fail actually), this recipe was a complete winner! The original recipe was a plain lemonade recipe, but I've been meaning to try out more of the candy oils that I bought from LorAnn Oils. If you want to go more natural, you can leave out the raspberry candy oil and use just the lemon juice to flavor the candies. This is actually the second batch of gummies that I made. I tried coloring the first batch with two different kinds of food coloring. Rather than resulting in a pretty pink color, the food coloring pooled up and streaked through the liquid candy mixture. Both liquid and powdered food coloring did absolutely nothing. The moral of the first batch? Don't try to color these candies, it just won't work. The flavor of these gummies is out of this world! 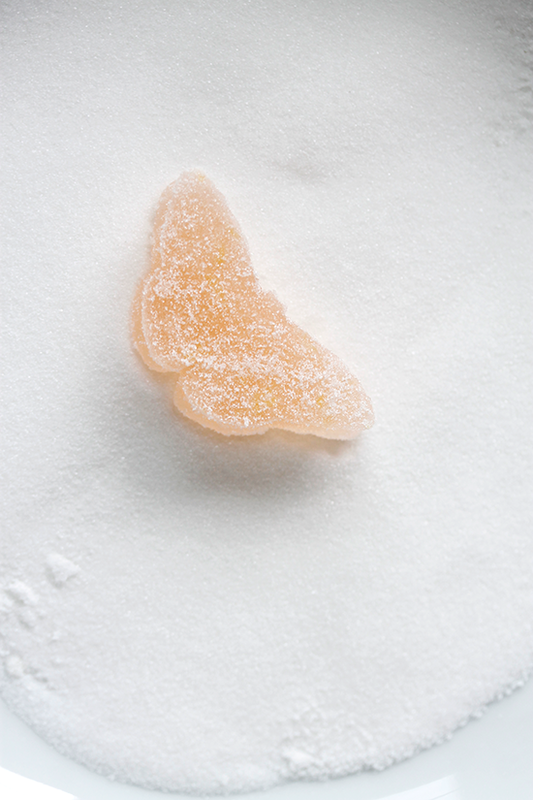 The raspberry candy oil adds the right amount of sweetness to a very tart lemon base. This recipe would probably also work really well with a bunch of different fruit juices. I'm thinking that a watermelon candy would be amazing for the summer! 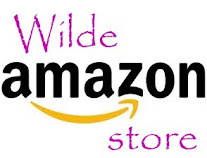 What kind of gummy candy would you like to see on WITK? This recipe was so quick and easy, I can see making it time and time again. One Year Ago: I didn't blog at all in May or June last year! Insane! Coat a 9x13-inch loaf pan with cooking spray. Use a paper towel to wipe out most of the oil. Sprinkle gelatin over 1/2 cup of water and stir to suspend the gelatin in water. Let bloom while you prepare the sugar syrup. Combine remaining 1/2 cup water with 2 cups sugar in a 2-quart pot. Place over medium heat and bring to a boil. Clip on candy thermometer and let boil, without stirring, until temperature reaches 260 °F. Remove the pan from the heat and add bloomed gelatin. Whisk in to dissolve the gelatin. Add lemon juice, zest and raspberry candy oil. Whisk to combine. Pour candy syrup into the prepared loaf pan. Let sit at room temperature for about 3 hours. Sprinkle castor sugar over the tops of the candy. 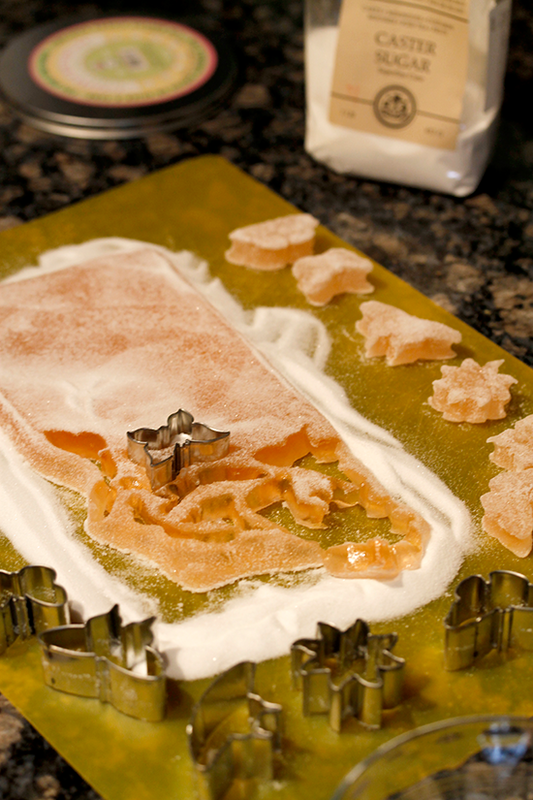 Peel candy slab out of the pan and flip onto a plastic cutting board. Sprinkle the other side with castor sugar. 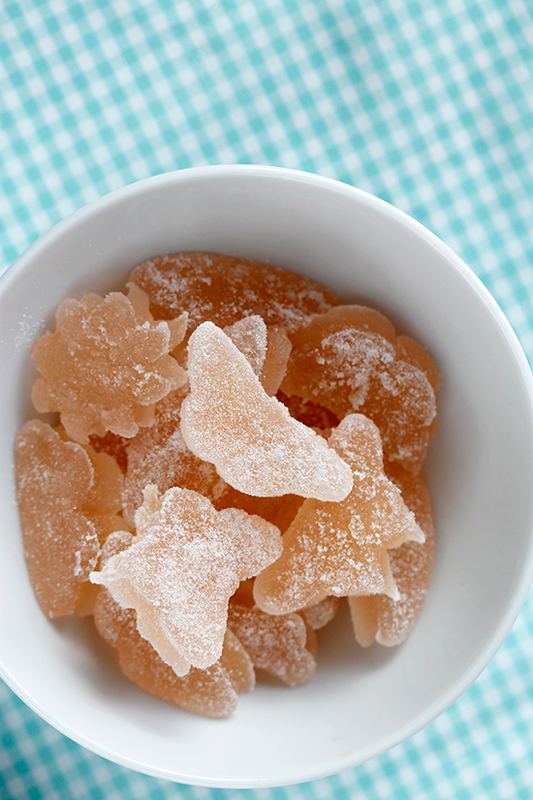 Stamp out candies with miniature cookie cutters (here are the butterfly shapes that I used). Coat edges with more sugar. 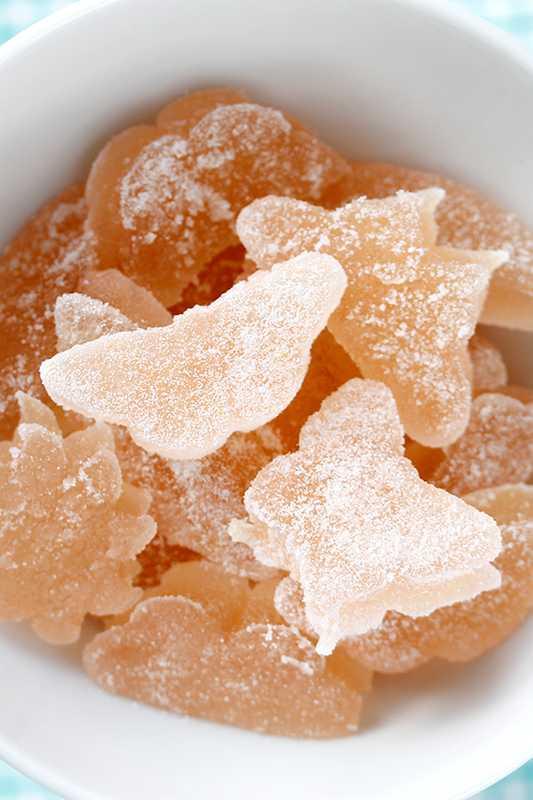 Leave candies on wax paper for about 8 hours before transferring to an air-tight container. Layer the candies between layers of wax paper.